A female kidnapper met her waterloo in Ajao Estate area of Lagos, after hypnotizing a teenage girl who she asked where she can find a warehouse. However the teenage girl was saved by her Uncle, who drove through the street she stood with the kidnapper. Upon interrogation the female kidnapper who claimed she speaks only french, confessed to hypnotizing the girl she planned to use for rituals. This angered residents of the area, who beat and stripped her naked. She was however saved and whisked away by Policemen. ‘Wonders shall never end oooo my pipl pls we all need to be careful ooo don’t send ur young wards out unaccompanied. Becos dis kinds are everywhere now. Dis story I’m about to share happened in my area. Okeafa dat canoe new road dat leads to ajao estate n many oda places most of us shld be conversant with d road on d pictures below.d pictures below are dat of a woman kidnapper who hypnotized a teenage girl from ajao estate.Taking her to God knws where. She took dis gurl from ajao estate all in d name of looking for a warehouse,d innocent girl has been hypnotized n working under her instructions.so she followed her from ajao estate wen dey get to canoe my street to be precise her co worker appeared two guys asking Dem wat dey are looking for dis woman said she doesn’t understand English as she is from Togo n speaks n understands French only.so d oda guy interpreted telling d girl dat she said she is looking for a warehouse. D oda guy now said dat der is one at ejigbo. Dat dey shld take marwa from der. As dey were waiting for marwa d innocent girl sighted her uncle’s car passing by n her uncle also has seen her standing with dis strange so he stopped,bfore d guy could finish parking dis woman ran into my street n hid behind some cars parked der.d gurl told her uncle dat dey are looking for a warehouse ooo. D guy asked her who she was with? D gurl turned bck n couldn’t find d woman. D woman in her hide out saw dat d man has entered bck into her car she came out again dragging d gurl dat dey shld go ooo,dat she shld forget abt her uncle.Not knowing dat d man is still watching.D man came out n rushed to where dey were immediately dis very woman dat claimed to be from Togo n dosnt understand English or any other language started speaking Igbo. 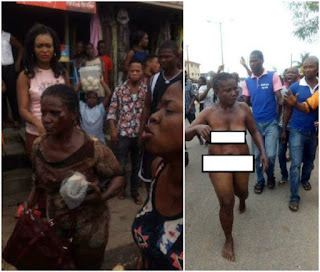 0 Response to "Female Kidnapper who hypnotized teenage girl, caught and stripped naked in Lagos (Photos)"